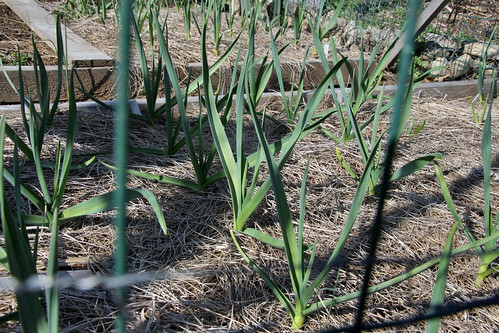 It looks like it'll be a fantastic year for garlic. Maybe its the big fancy (expensive) bulbs I mail ordered, or maybe it was a good winter for garlic. Maybe both. It seems it was a fairly average winter here - not overly cold, good snow cover and then an early, warm, sunny and very wet spring. Anyway, the plants are big and healthy looking. I counted today about 100 garlic plants in my plot. Maybe too many, but in past years I haven't had near enough, so I'm still working out how much I can use. I'm hoping to be able to save my own bulbs for planting next year. Maybe 10% will be for replanting and I won't have to pay the high price of seed bulbs. I bought very nice quality garlic last fall from Territorial. I also got garlic from Territorial last fall. So far so good on the plants. Not quite as big as yours, but we're a little behind on weather I think. I'd love to grow enough to save for planting, but I'm not sure if I have the space. Maybe when I expand the edible gardens into the front yard. My garlic is doing very well also. It's really grown in the last two weeks. I simply planted it from saved cloves of last year's crop. Great to expand into your front yard with edibles! My neighbor down the road just turned over her whole front yard for vegetables. She had a nice vegetable garden there last year too. Not a common sight, but I love it. I think it is a really good year for garlic so far. Mine is doing really well this year. I even had no winter kill at all. Yes, a good year for garlic indeed! Mine is bigger than I've ever seen it before - up to about mid-thigh already. I should go count how many we planted. We never have enough.